Learning objectives, learning evaluation, and learning steps are the essential components in a lesson. They have to be interconnected to provide a qualified learning for students. Physics learning about Newton’s Second Law faced problems in connecting those learning components. 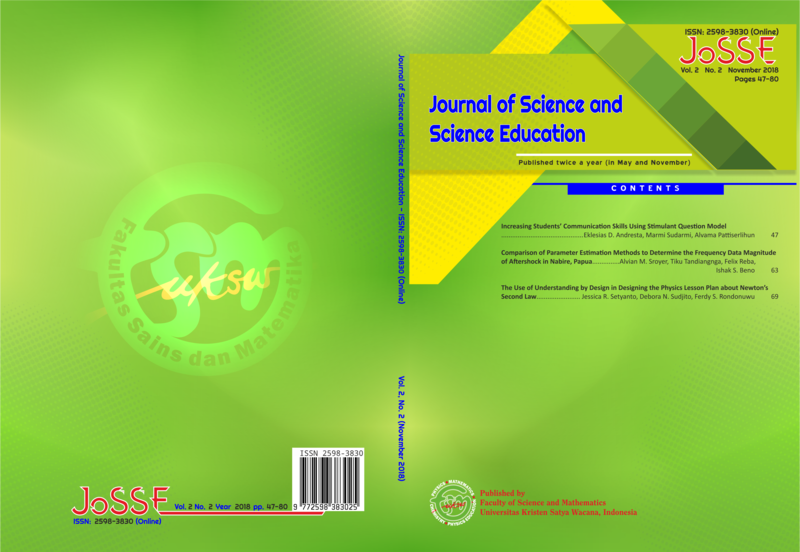 This study aims to make an alternative design of physics lesson about Newton's Second Law using Understanding by Design (UbD). The lesson plan and the review sheet were submitted to three reviewers. All data collected from the review sheet were analyzed using a descriptive qualitative method as the basic to revise the initial design into a better final design. The design was revised based on the recommendations of the reviewers. UbD can be used as an alternative design of physics lesson about Newton's Second Law. Designing a lesson using UbD is helpful in connecting the objectives, steps, and learning evaluations so that the students can achieve the objectives of the lesson. Dolong, H. M. J. (2016). Teknik Analisis Dalam Komponen Pembelajaran. Vol 2, pp. 293-299. Sgro, D. S., & Freeman, A. S. (2008). Teaching Critical Thinking Using Understanding by Design. This paper was presented at Annual Conference and Exposition. Agricultural and Biosystems Engineering Conference Proceedings and Presentation, Iowa Stage University. Tuder, I., & Woldorn-Urban, H. (2015). Conceptual Understanding of Newton’s Second Law-Looking Behind the FCL. University of Vienna. Wiggins, G., & McTighe, J. (2005). Expanded 2nd Edition Understanding by Design. USA: Association for Supervision and Curriculum Development. Wittmann, M. C., & Anderson, M. K. (2009). Comparing Three Methods for Teaching Newton’s Second Law. https://www.researchgate.net>publication. Wulandari, Y. A. (2014). Remidiasi Miskonsepsi tentang Gaya Sentripetal Dan Gaya Sentrifugal Pada Gerak Melingkar Beraturan Menggunakan Metode Demonstrasi Sederhana. www.repository.uksw.edu. Yudianti, T. P. K. (2013). Penggunaan Kartun Sebagai Instrumen Diagnosa Miskonsepsi Tentang Gaya-Gaya Yang Bekerja Pada Benda Diam Dan Bergerak.www.repository.uksw.edu.